theres a great deal of info here to look thru. 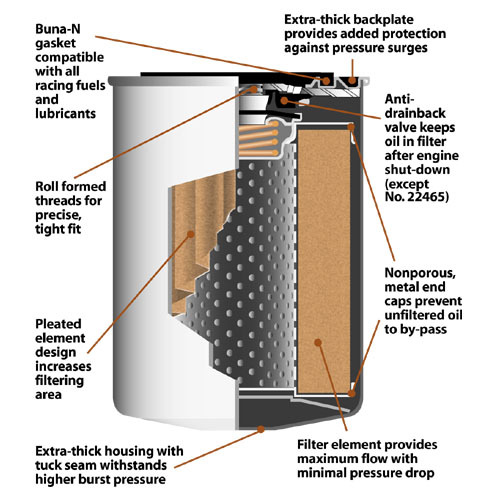 pay attention to filter construction and the filter materials and total filter medium area, when discussing oil filters keep in mind their intended function, which is mostly too efficiently trap and remove particulate and metallic debris circulating in the oil flow,from various sources like wear, and outside dirt, to prevent it from reaching the oil film supported surfaces in the bearings and valve train. 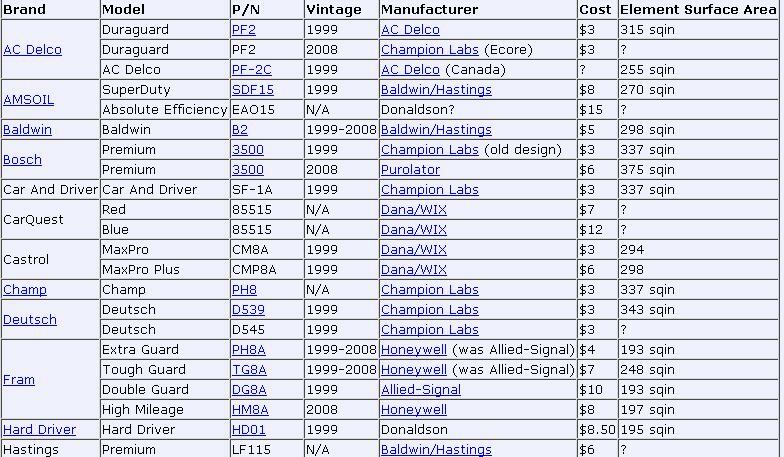 There are basically six mfgs of oil filters for all the high volume filters sold in the USA. Baldwin/Hastings,Champion Labs,Dana/Wix, Donaldson, Honeywell and Purolator. not counting the imported , and mostly off brand stuff. 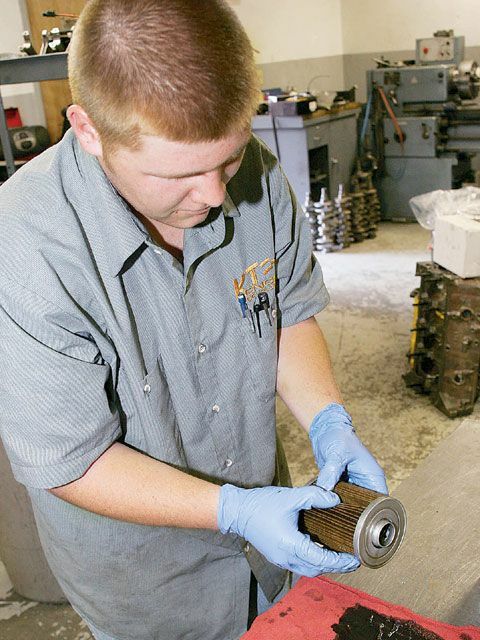 "Abrasive engine wear can be substantially reduced with an increase in filter single pass efficiency. 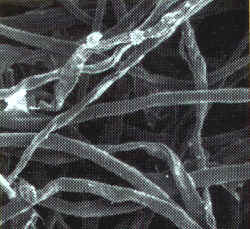 Compared to a 40 micron filter, engine wear was reduced by 50 percent with 30 micron filtration. Likewise, wear was reduced by 70 percent with 15 micron filtration." 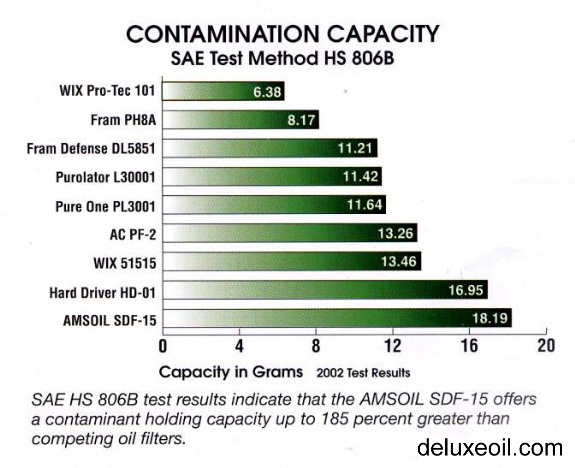 By combining this type of oil filtration with the superior protection and cleanliness of a premium synthetic oil, you will virtually eliminate engine wear. obviously filters with more effective filtration will need to have larger surface areas and be changed more frequently to maintain high flow rates. 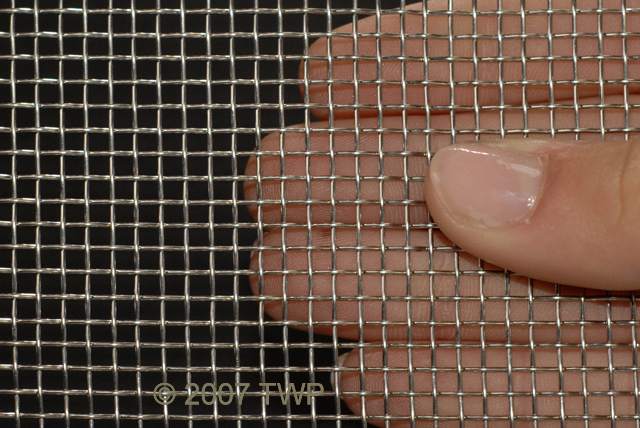 some filters have less than 200 square inches of filter area and are poorly constructed, some more than 480 square inches of filter area and much better construction, make up your mind after looking at the facts, depending on advertizing is misleading, remember the size of the pores (holes in the filter medium) and the number of the pores or the thickness of the filter medium varies a great deal between brands, generally the more surface area and the smaller the pore micron reading and the more pores per square inch the better the filter will be at trapping crud in the oil, but once a filter starts clogging those filter pores its reducing its flow potential and as a result it tends to increase resistance to oil flow rates. 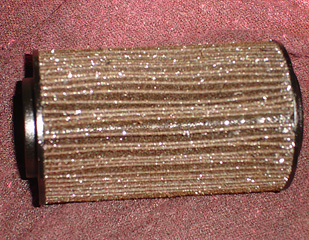 a highly effective oil filter will need to be changed frequently because the more crap it traps the more restrictive it becomes meaning the oil filter will eventually clog and once the difference between incoming oil pressure exceeds about 8 psi some or in a few cases most of the oil flow bye-passes the filter medium thru that by pass valve. 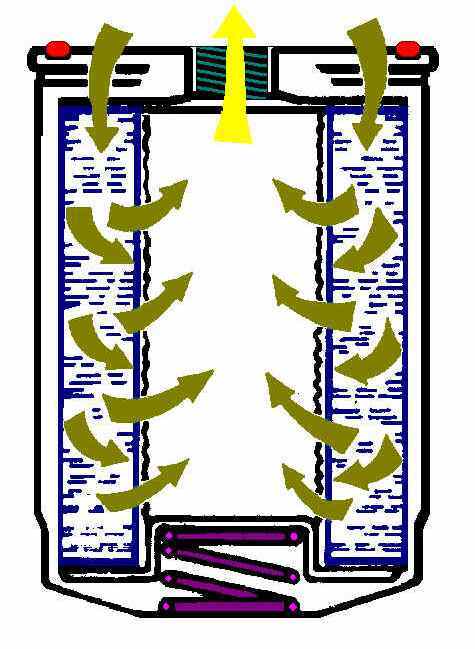 a filter with a courser, more porous medium may not clog as easily but it allows much higher quantity's of fine soot to constantly circulate. if you have a reasonably friendly NAPA parts counter guy ask him to look up the longer length version of what ever WIX oil filter fits your particular engine,IF YOU HAVE THE ROOM TO INSTALL A LONGER FILTER in most cases theres several filter lengths and the longer versions add capacity, cooling and increase filter medium surface area, all good things especially if you need to trap potential sludge build up or metallic debris, buy a decent strong, constantly re-useable magnet to attach to the bottom of the filter and you significantly increase its ability to remove crud even further. 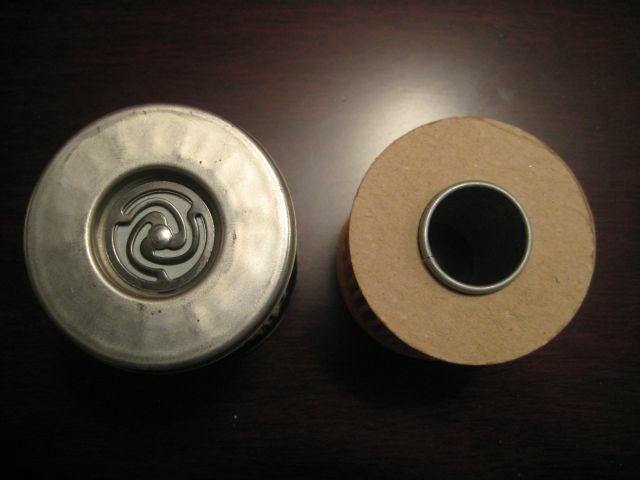 its basically a heavy duty can opener , or an oil filter cutter , is designed to make it easy to internally inspect oil filters, by allowing you to remove the filter element , from inside the surrounding (CAN) for close visual inspection. ,"HIGH VOLUME OIL PUMPS HEAT YOUR OIL"
OIL PUMPS, EVEN WHEN RUNNING AT MAX PRESSURE AND BY_PASSING A SIGNIFICANT PERCENTAGE OF OIL BACK THRU THE PUMP, YET THEY DO NOT ADD SIGNIFICANT HEAT TO THE OIL, metallic debris from a cam lobe failure potentially destroying bearings,is a potential problem with the newer oils designed not for flat tappet but roller tappet engines that contain less friction reducers like ZDDP, most guys think the oil filter would prevent that, but forget that all that metallic debris passed thru the oil pump well before it reaches the filter and circulated in the oil pan getting thrown randomly around as the crank spins , before entering the oil pump, plus the oil pump bye-pass and oil filter bye-pass both tend to allow metallic debris to pass thru if clogged with crud from a failed cam lob, lifter or bearings . (usually oil and coolant has reached 190F-215F) well one big reason is that thicker oil viscosity when oils cooler ,takes a good deal more pressure to force thru the filter medium, once the oils fairly hot it flows better, and requires less pressure as it offers less resistance to flow thru the engines clearances and thru the filter, that in turn means that hot oil with its thinner effective viscosity tends to be far less likely to force open the filter bye-pass circuit and that means oil bye-passing the filter medium is far less likely to drag metallic trash held in suspension with it to reach the bearings to cause more rapid wear. 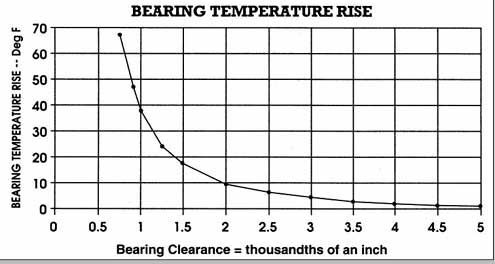 if you push the oil at a high enough pressure and volume across the bearing surfaces,you can absorb and transfer heat out of the bearings very efficiently. 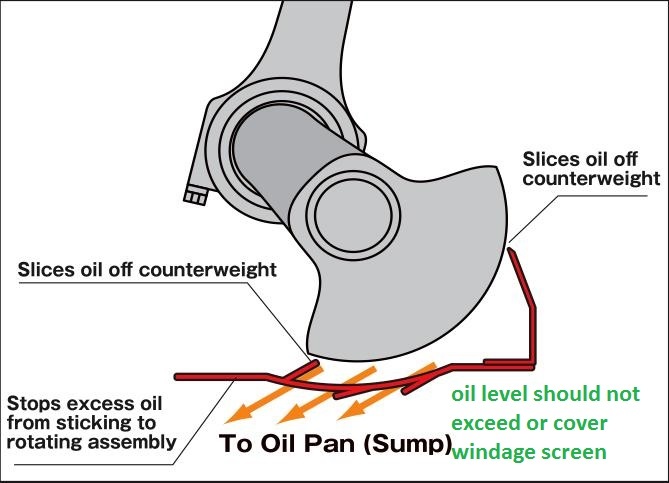 the limited ,flow of stock oil pump volume , will not absorb or move as much heat out of the bearings ,compared to the higher , volume oil pump, can potentially. the oil pumped by the aftermarket larger volume of oil pumped, passing over the surface will , by moving more oil, thru the clearances move more heat out of the bearings,heat thats absorbed and transferred is transferred at higher,rate, as a higher total amount of heat,is absorbed heat transfer per oil volume in contact with the bearing surfaces, is lower. 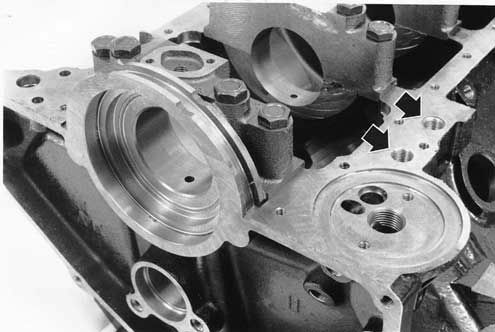 (1)as the oil volume passing over the bearing surface, and valve train, heats up it can absorb a lower percentage of the bearings heat, so keeping the oil much cooler than the bearings is critical, so maintaining a large volume oif oil and allowing it to cool, or dissipate the heat is absorbed is critical to the whole process. having a larger capacity oil pan and if required an oil cooler with aux electric fan is a good idea. 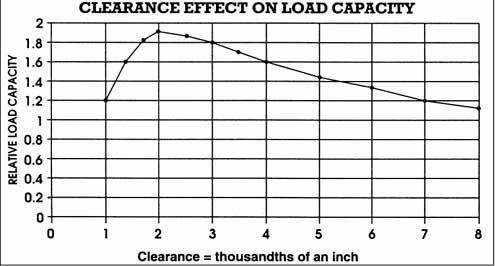 (2)as oil heats up it breaks down, and by the time mineral base oils hit 260 degrees they have lost significant lubrication, while the better synthetics break down slower and have a higher heat tolerance. It could easily be that your dealing with far less total surface area on the fram filter, which could easily be what reduces flow rates, and increases pressure. 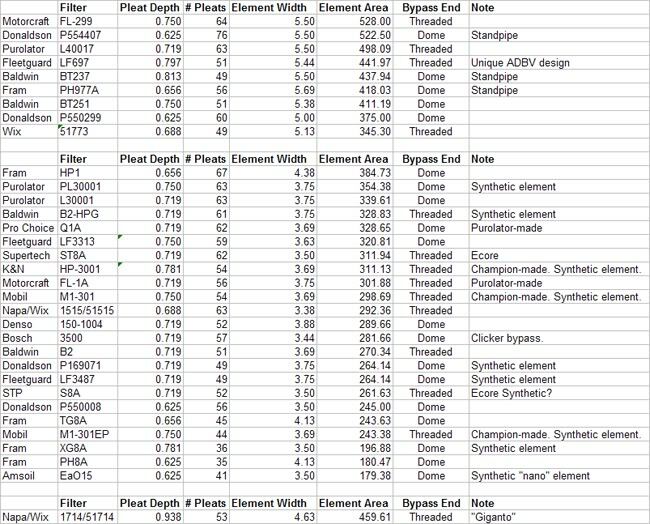 if the filter elements IDENTICAL and the one filter has 200 inches of filter medium vs lets say 350 for a different filter there should be a reduced restriction to flow of about 57% with the larger surface area with identical filtration, well that is of course with brand mew filters, obviously the smaller filter area will clog much faster as it gets filled with crud in the pores of the filter medium. 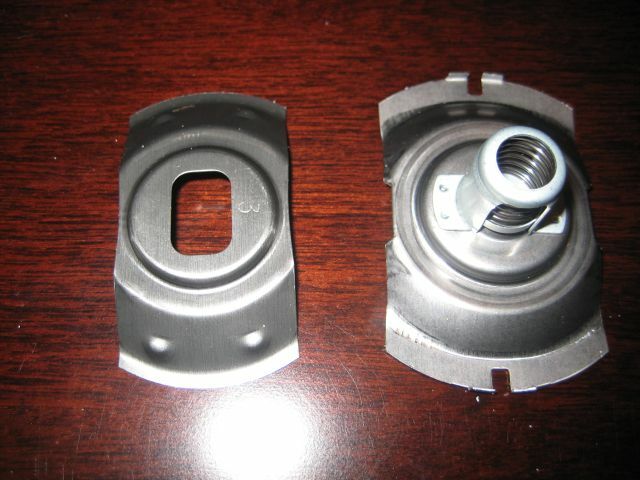 but keep in mind the surface area of the filters, and physical construction vary by brand and part number and so does the materials and drain back valve construction. look at the top picture and keep in mind that those two connecting hoses COULD be flipped as to what end(in/out ) on the remote filters gets hooked to the bypass adapter (IN/OUT) ports, hook it up correctly and everything works just fine! but swap the two hoses on only one end and YOUR OIL PUMP tries to push OIL PAST the ANTI-DRAIN BACK VALVES on the oil filters,(and most of the time is marginally successful in that a trickle of oil does get to the bearings and rocker arms at idle) now at idle you'll still get good oil pressure (about 15 lbs) but rev the engine and the highly restricted oil flow pressure goes up very slowly but the oil VOLUME getting into the block is so low you'll spin a bearing in about the first 20 minutes ( and 99% of the time the guy that does this blames the guy who built his engine for putting it together WRONG when in fact the engine could have been PERFECT but with no oil reaching the bearings under load the engine is history within at best about an hours running time! 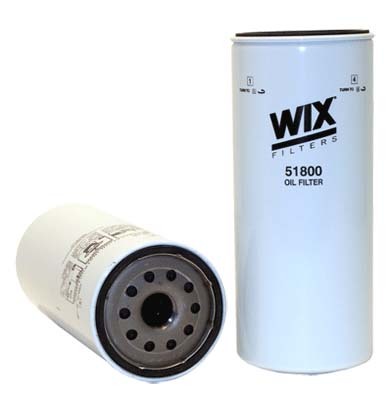 Since 1954 when we patented the first spin-on oil filter, WIX Filters has been at the forefront of oil filter technology and performance for passenger cars, light trucks, heavy trucks and buses, and off-highway vehicles. 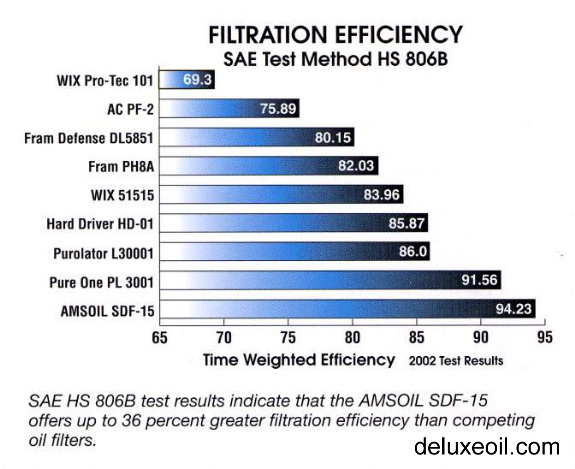 SAE J806 tests prove that WIX oil filters hold 45% more dirt than the leading national brand - meaning we keep filtering long after the competition has completely quit. 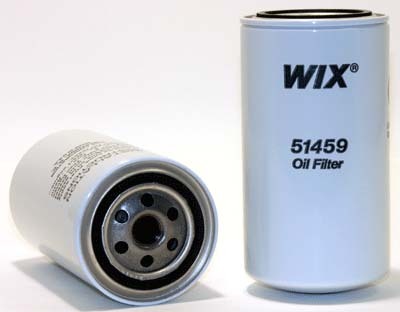 Use our Filter Look-up feature or consult you nearest WIX distributor using our Where To Buy to find the best WIX oil filter for your needs. 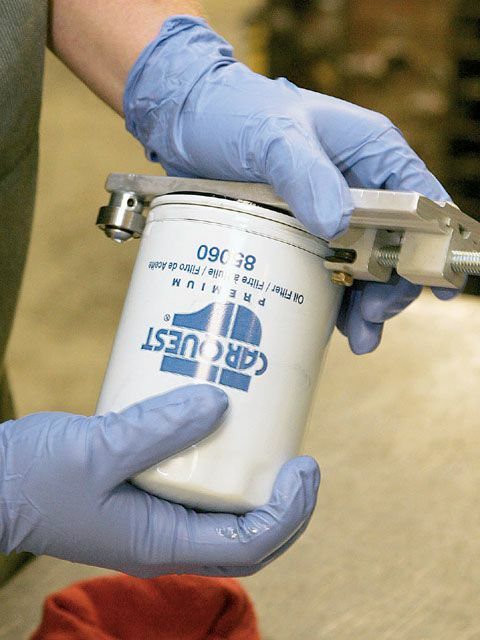 You may take your oil filter for granted, but this small, inexpensive part of your vehicle's lubrication system plays a vital role in protecting the engine from premature wear. 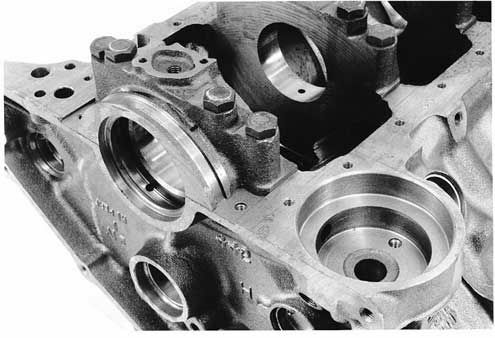 Each moving part in the engine and the cylinder walls requires clean oil for proper lubrication and lasting life. 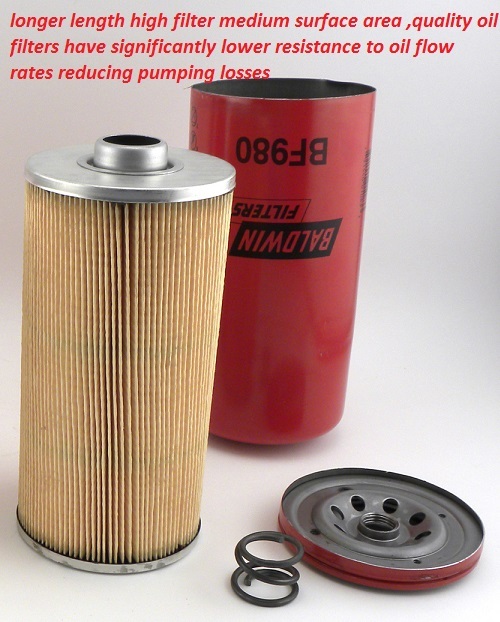 The oil filter cleans the oil as it passes through the filter element or filtering media. This prevents abrasive contaminants in the engine lubrication system from damaging engine parts. 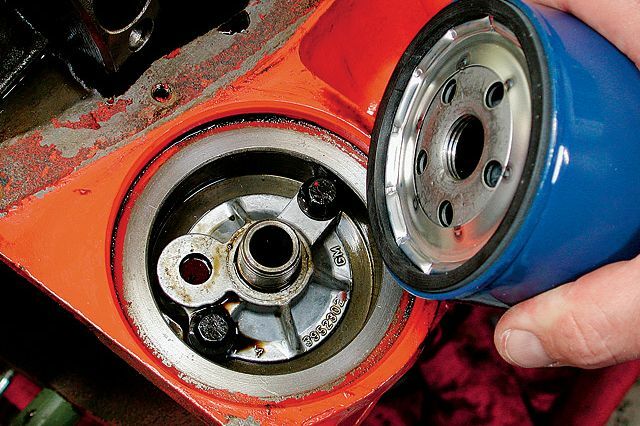 The better you understand your engine's lubrication system, the more you'll appreciate the vital role your oil filter plays. 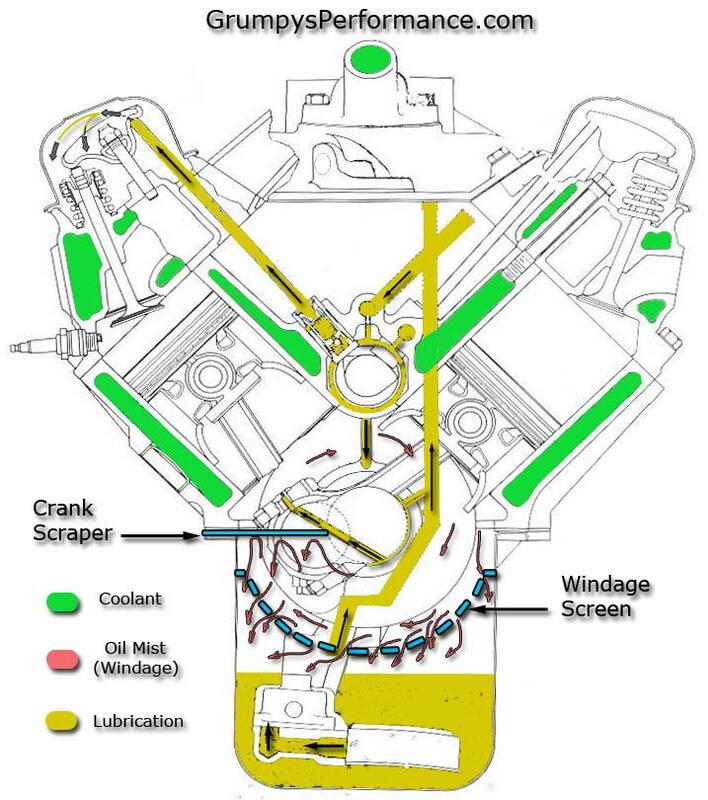 When the engine is running, oil enters the oil pump through a screened intake. 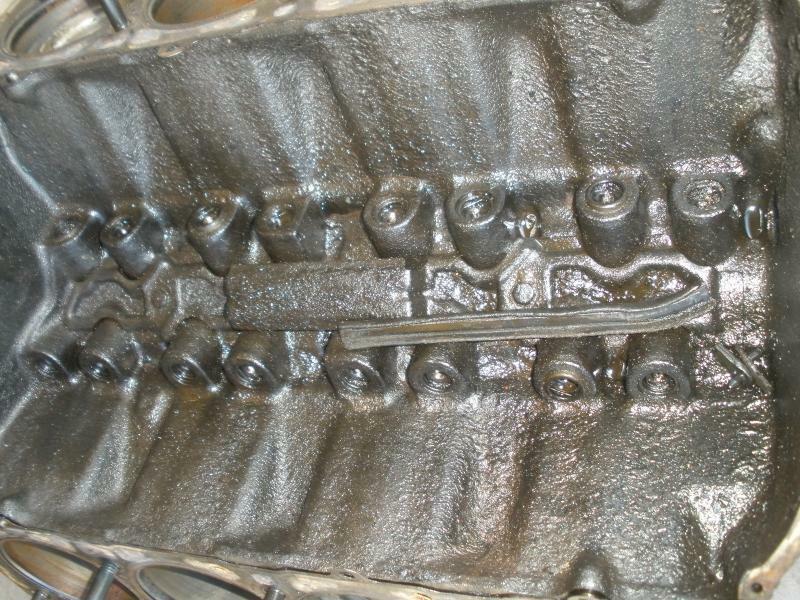 The screened intake -- or oil pick-up -- is located in the crankcase near the bottom surface of the oil pan. 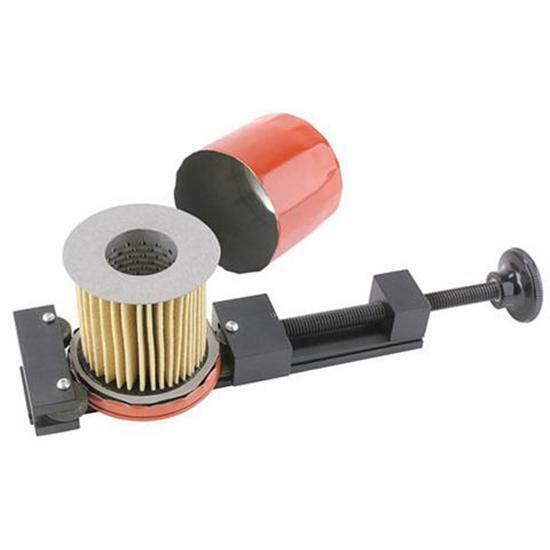 The oil is drawn through the screen intake and forced by the oil pump through the oil filter. Oil from the main gallery is also fed through vertical passages to the crankshaft main bearings and through the crankshaft to the rod bearings. 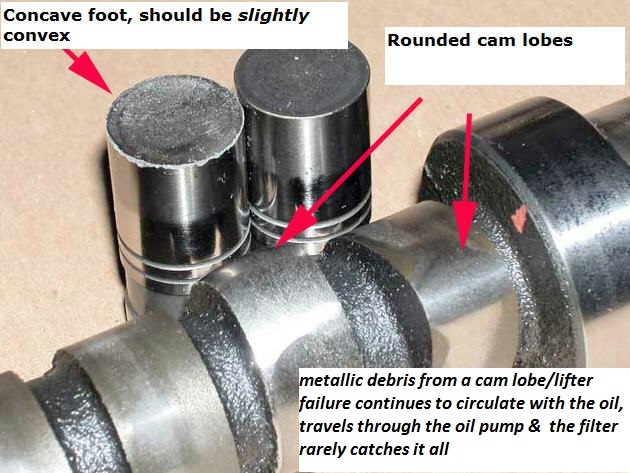 Oil thrown from the crankshaft, or sprayed from the connecting rods, lubricates the pistons and cylinder walls. In a typical full-flow type oil filter, the oil flows into an inlet passage and then through the filtering element. After flowing through the filter element, the filtered or "clean" oil passes directly to the main oil gallery. 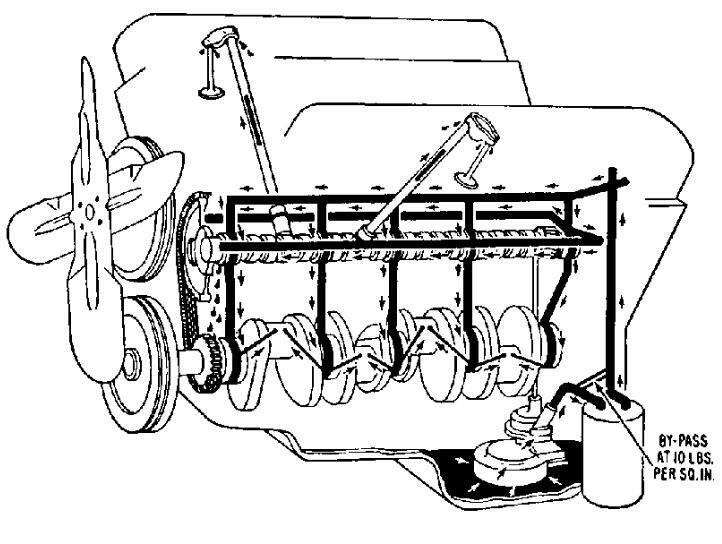 In a partial-flow type filter, the oil returns directly to the oil pan. Oil from the main gallery lubricates the camshaft and the camshaft bearings (and feeds hydraulic valve lifters if used in the engine). 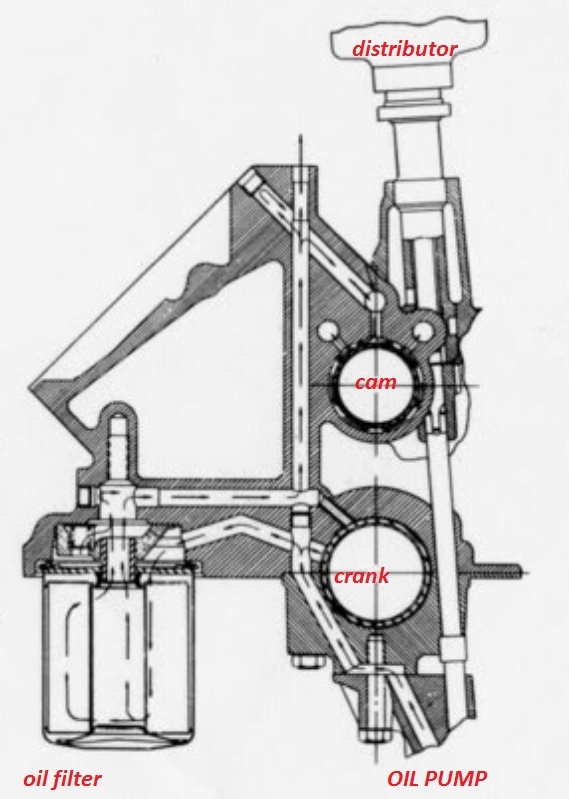 On non-overhead cam engines, oil is metered through the valve lifter to a hollow push rod that carries oil for the lubrication of the push rod pivot point, rocker arm pivots and valve guide. 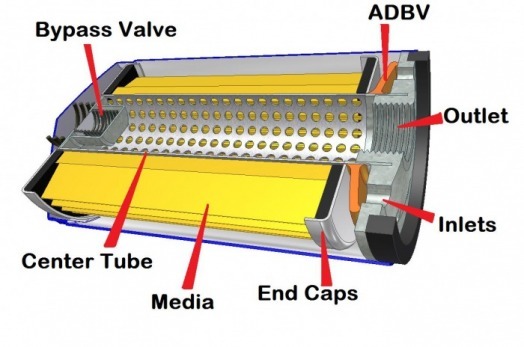 The media is the filtering material in the oil filter element. 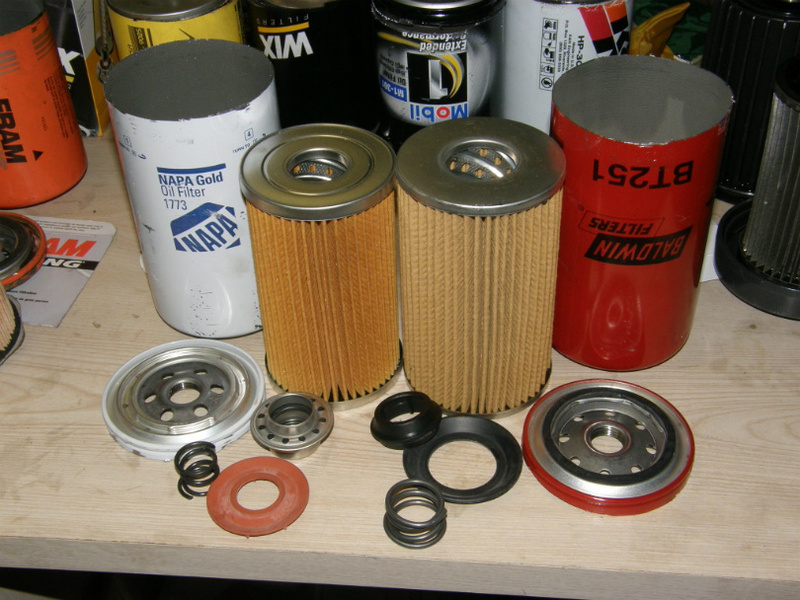 It essentially determines the efficiency, performance and useful life of the oil filter. Particle size retention is the measure of the degree to which the filter can retain particles of various sizes. 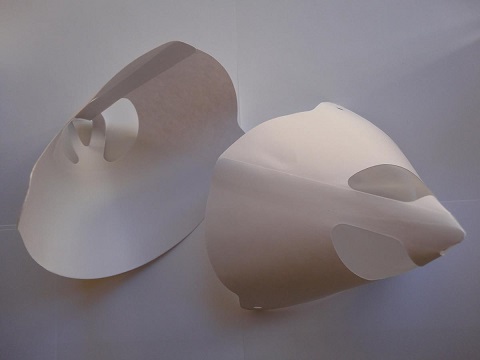 Wix has developed optimum particle size retention quality in filter media by extensive engine wear tests including exhaustive testing of filters used in racing, and sophisticated laboratory tests. Wix media in the automotive full-flow oil filter is able to trap and hold essentially all the contaminant particles larger than 25 microns. 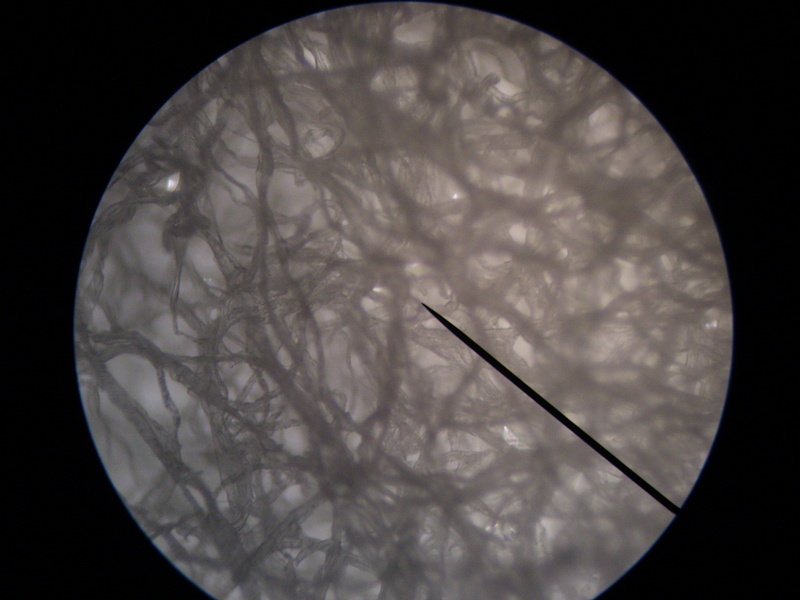 (A human hair measures approximately 70 microns in diameter. 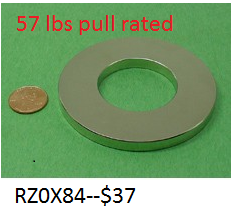 An object that is 1 micron in size is .000039 inches in diameter.) 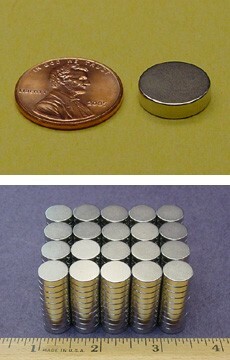 Our filters also capture a high percentage of even smaller particles. Dirt-holding capacity is the amount of contaminant that can be removed and held by the filter until the filter ceases to function. 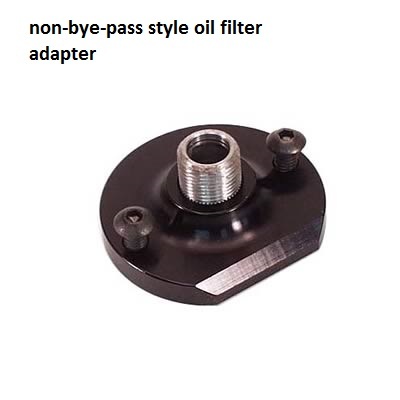 The capacity of Wix filters is significantly larger than the minimum requirements to efficiently filter all the oil during the oil and filter change periods as specified by vehicle manufacturers. WIX full-flow oil filters for automotive applications use arch-pleated, prescription-blended media. When new, the media with a maximized number of pleats has less than 2 psi pressure drop when filtering oil at a rate of 4 g.p.m. at normal operating temperature. 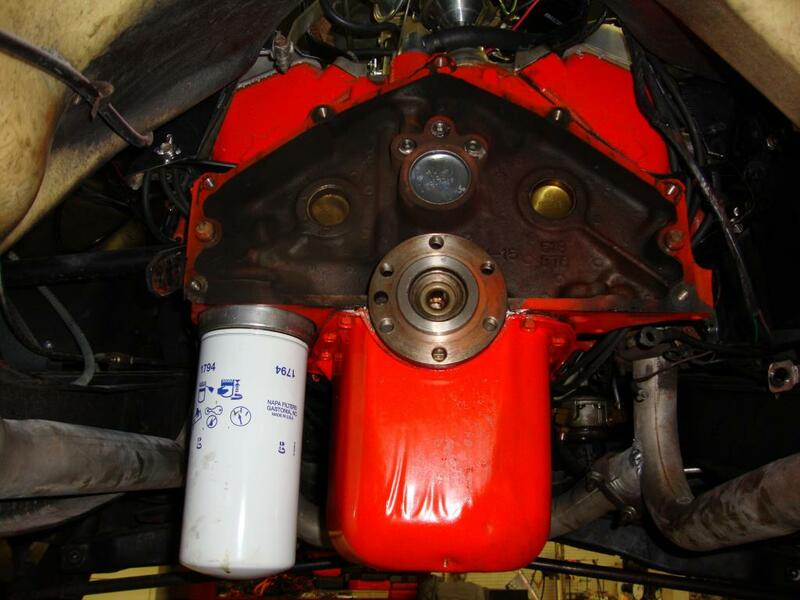 This low initial restriction to oil flow protects the vital engine parts more effectively. 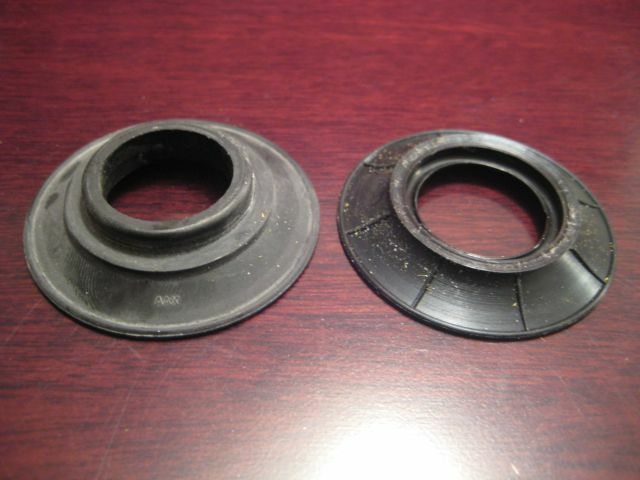 Gasket - provides exterior seal between the filter and engine at the engine mounting surface. 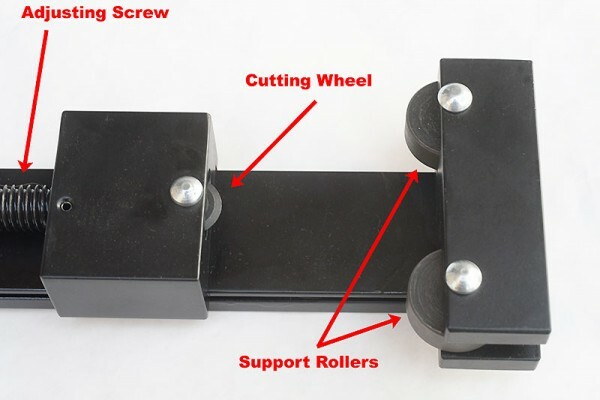 Mounting Plate - prevents deflection (movement) at the gasket sealing surface. 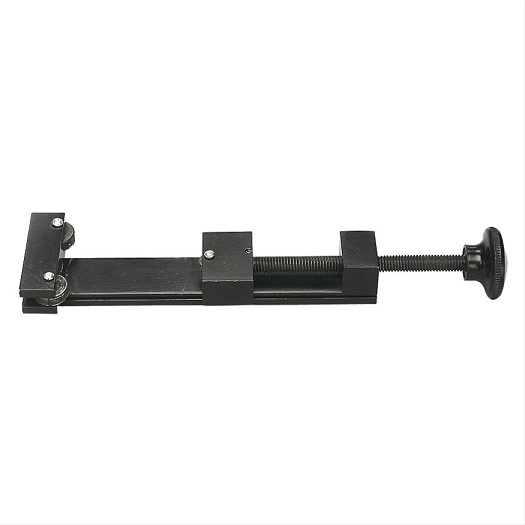 Heavy gage steel plate provides for threaded attachment to the engine. 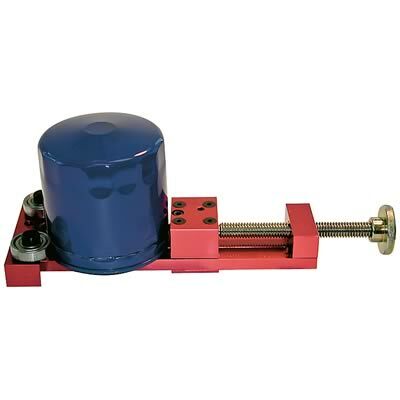 Inner Element Support - provides inner element stabilization and a positive seal between the inner element and the mounting plate to prevent the bypass of unfiltered oil. Upper End Cap - retains element end sealant and filter media, provides an outlet for clean oil, and provides structural rigidity to the pleated media. 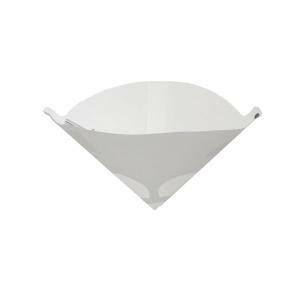 Lower End Cap - retains element end sealant and filter media. 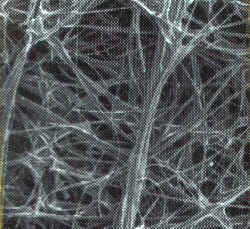 Arch-pleated, Prescription-blended Filter Media - provides a more than adequate filter area. The element has a controlled porosity blended media to assure complete filtration of the oil. Spiral-wound Center Tube - provides internal element support. 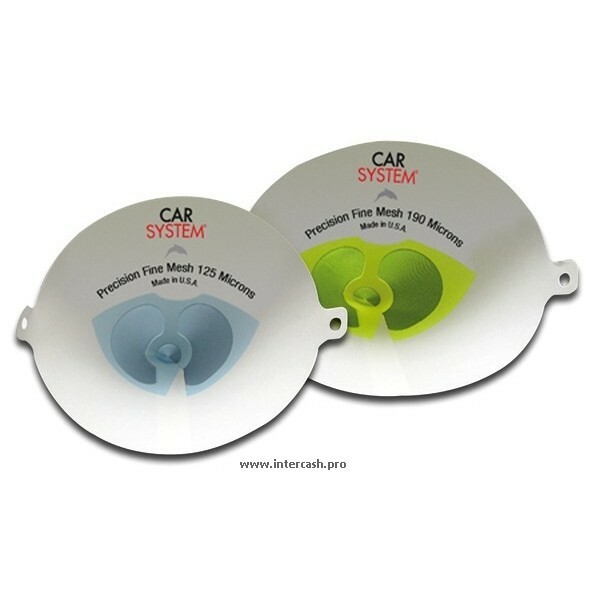 The spiral design greatly reduces initial flow restriction when compared to other designs. 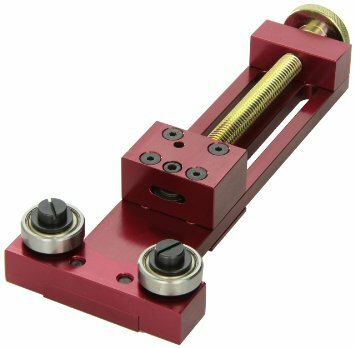 Coiled Spring - ensures a constant load on the inner element to maintain the seal between the upper element end cap, the inner element support, and the mounting plate even during pressure surge situations. 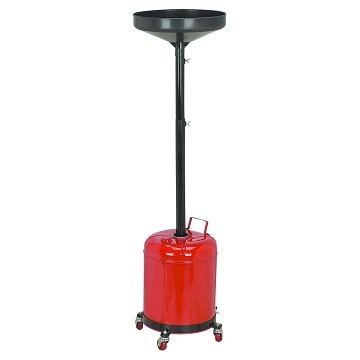 Filter Canister - encloses the assembly with a mechanically-locked double seam. 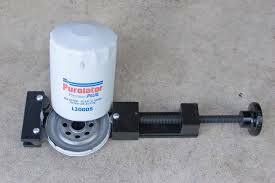 The canister provides "flutes" at the closed end for ease of removal with an oil filter wrench. Silicone Anti-Drainback Valve - Stays flexible in extreme temperatures, improves oil flow and keeps oil in filter to prevent engine destroying dry starts. Also provides lasting protection to meet new vehicle manufacturers longer recommended oil change schedules. 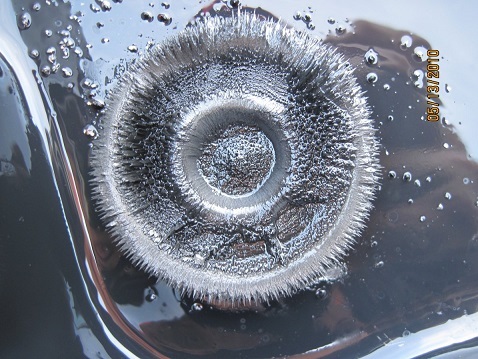 Nitrile valves can harden and become ineffective over time. 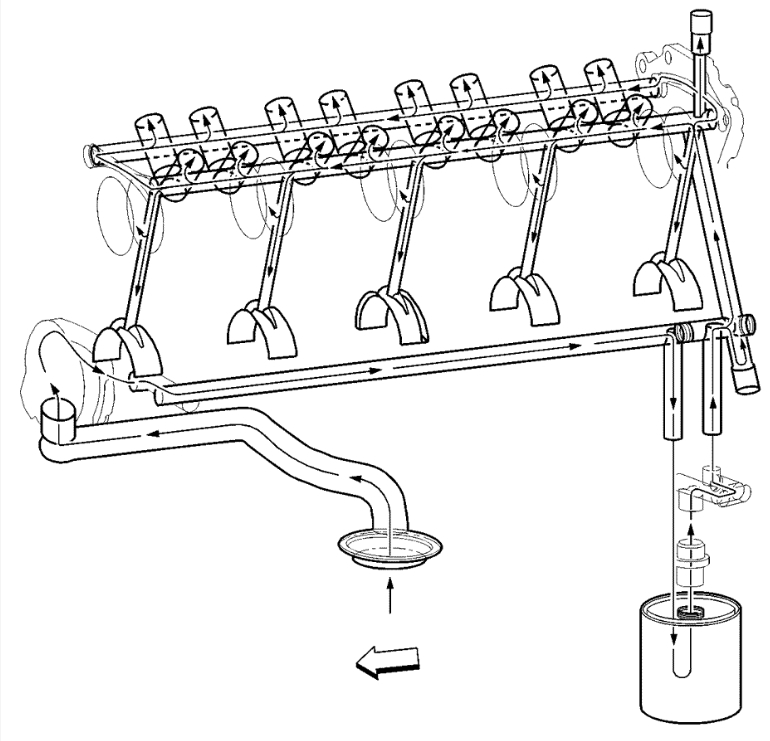 Some WIX full-flow filters include anti-drainback and/or filter by-pass valves. These types of filters are identical to full-flow filters, except that a by-pass valve replaces the inner element support and an anti-drainback valve has been added. 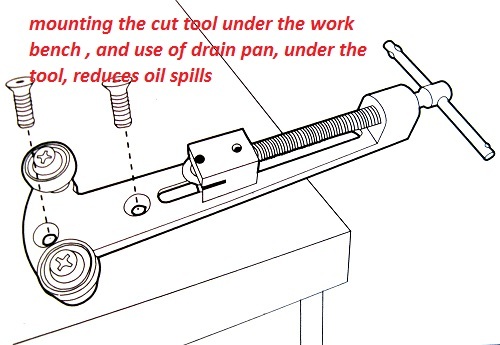 The Anti-Drainback Valve prevents oil from draining out of the filter inlet holes when the engine is shut off. It also provides seal between clean and dirty oil at the upper end cap. 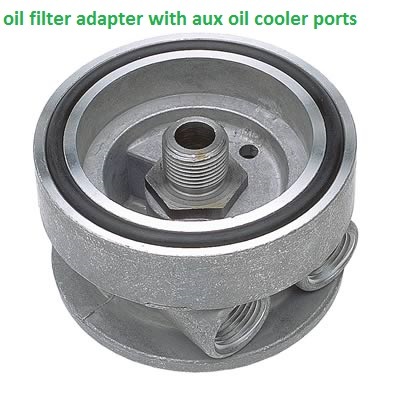 This is necessary in applications where the oil filter is mounted in a horizontal or inverted position. 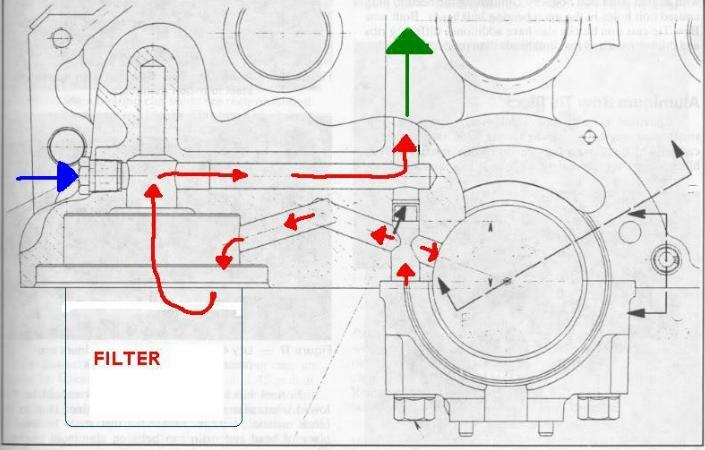 If a WIX full-flow filter becomes "clogged", or excessively restrictive to oil flow, the filter by-pass valve ensures continued engine lubrication by allowing the oil to by-pass the filter. Some vehicle manufacturers have the by-pass valve built into the oil filter mounting unit (located on the engine). Other vehicle manufacturers require full-flow filters have the by-pass valve built into the filter itself. 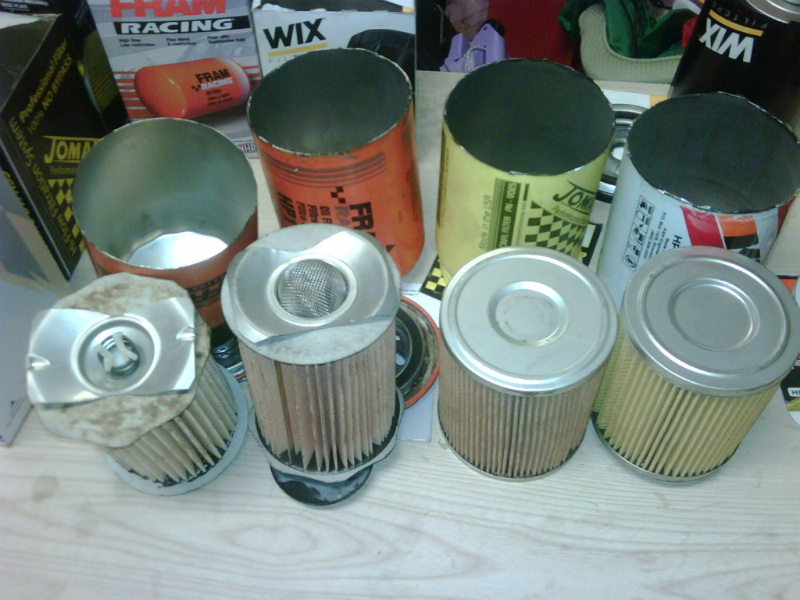 All Wix oil filter types recommended for these particular applications include the by-pass valve assembly in the filter. By-pass Valve Assembly -- spring loaded valve assembly that allows oil to by-pass the element under high-differential pressure conditions such as cold oil and/or excessively contaminated media. 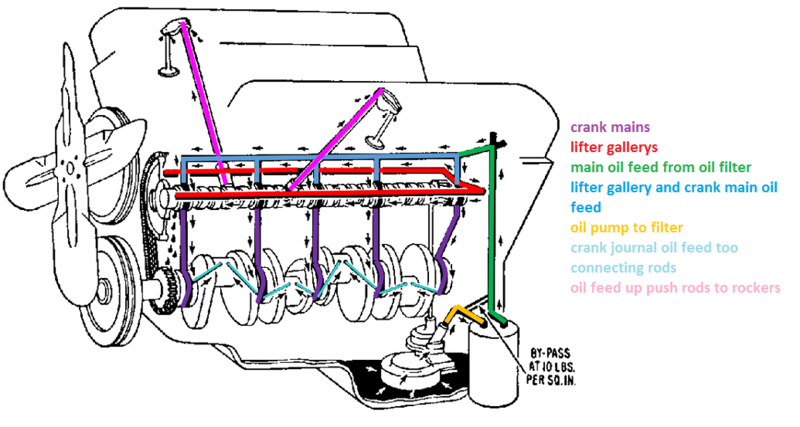 This allows lubrication of the engine, but without full-flow filtration. 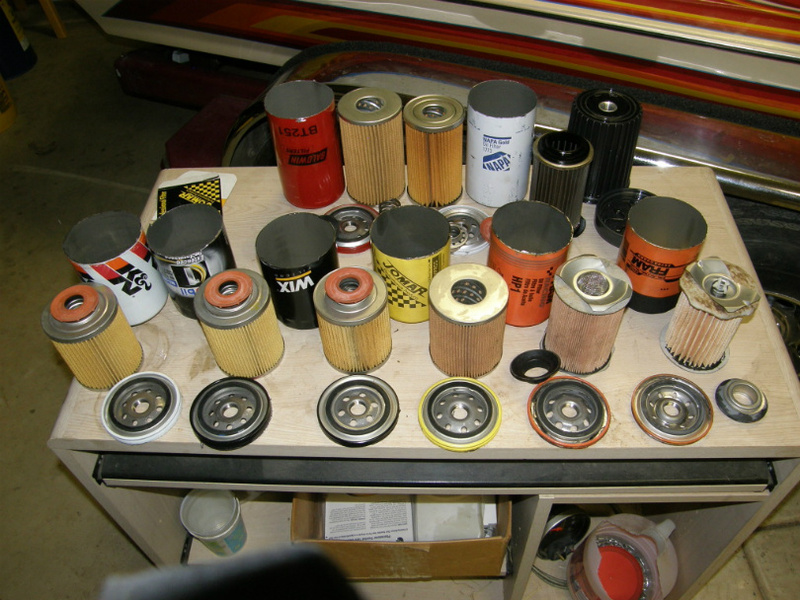 Fram puts out several lines of oil filters,and youll find info strongly suggesting they are less than ideal quality. that you tend to get what you pay for. and an almost total ignorance in the general public that. theres several levels of PRICE and QUALITY being sold under the one blanket brand name. if you insist on purchasing their low price line of cheap oil . obviously buying an oil filter can opener tool, and doing some close personal inspection of what your dealing with won,t hurt. "just what can I expect to see if the engines breaking in correctly vs what will I see if the engines got problems"
If your serious about maintaining peak engine durability you should invest in this tool, its basically a heavy duty can opener ,you mount under your work bench that allows you to easily open used oil filters, or an oil filter cutter designed to make it easy to internally inspect oil filters, by allowing you to remove the filter element , from inside the surrounding (CAN) for close visual inspection. so I think its more of a MARKETING PLOY than anything else. If we look at things realistically the vast majority of the public rarely bothers with actually doing regular scheduled oil changes. and it may help others if it does have a robust and durable additive package! but the thing that kills lots of engines is the fact that ALL oil traps and circulates combustion gases and soot! that contaminates and reduces the oils ability to lubricate, changing the oil flushes out the majority of the trapped contaminates. 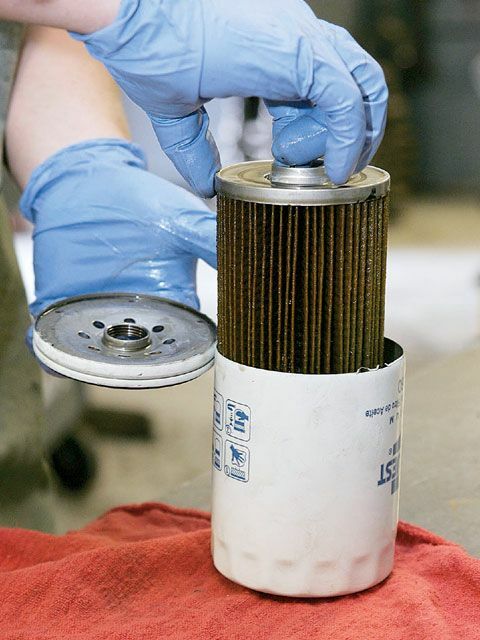 oil filters trap and hold the larger crap, circulating in the oil suspension, but over time the filter loses that ability, so it needs to be changed out. but if you really give a damn about your engines durability, Id simply change to new oil while your under the car changing out the oil filters at that time! Either of them is "about" 5 1/8" tall. 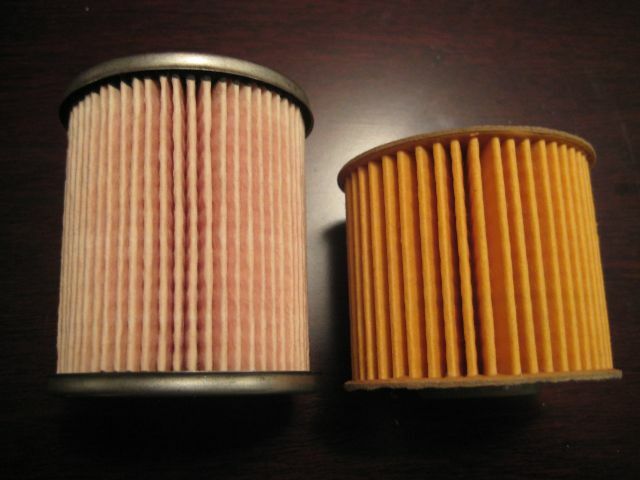 BOSCH, K&N,MAHLE,PUROLATOR, MOBILE-ONE,WIX, are all decent choices, but be aware that physically LONGER filters and filters with high plete counts tend to have more filter medium surface area and paper medium is generally not as effective as the synthetic mat filter mediums, but the main issue is most guys don,t replace the oil and oil filters regularly. 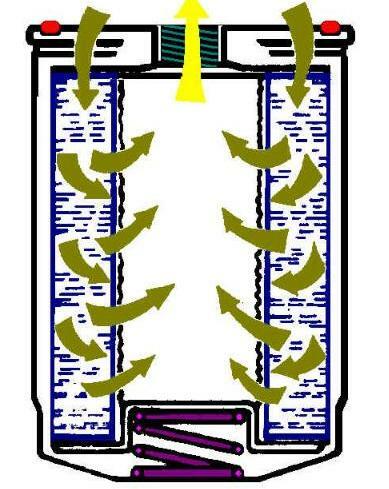 provides another failure point or adds to the restriction of the filter to oil flow. filter or is it something else??? And what are those numbers typically??? Watched this on youtube, pretty informative. 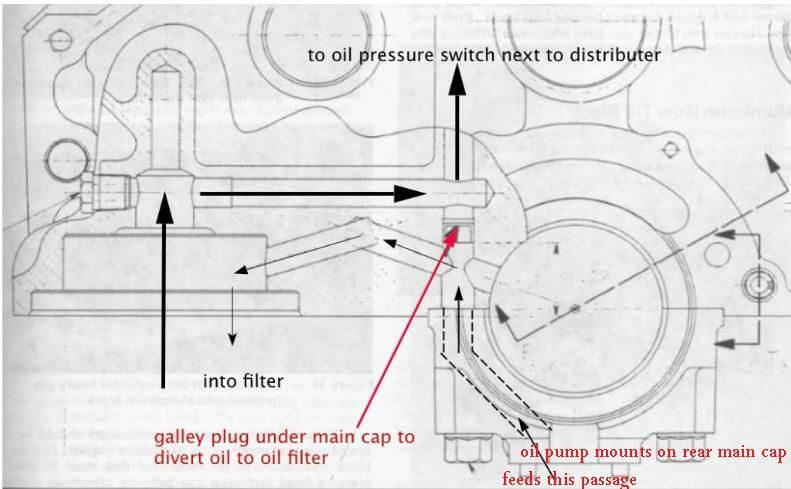 the oil filter bye-pass valve routes oil around the filter directly from oil pump to the blocks oil passages. I had Bob stop over to use my lift to do and oil change , he brought his own oil, and filter etc. like he usually does and while he put his car up on my lift I got the oil catch can ready, and the oil filter wrench etc. and after he had the car up I rolled the oil catch can under the car and got the large funnel end centered, I dropped the disposable paper paint filter with one of my engine magnets into the base of the funnel like Ive done for decades so that all the oil draining out of the engine drains out thru the filter and and ferrous metal sticks to the magnet which I can use to trap and spot potential problems, Ive done that on my cars for decades and did it as a mater of course without really thinking about it on his car, after all the magnets easily reusable, after its cleaned, the filters thrown in the trash and I'm out 20 cents but I'm also likely to catch any issues with bearing failing early before they become a big issue. "Ive seen you do that dozens of times and never thought to ask what the hell you were looking for,... well?" "the doc prescribes more frequent oil changes , but other than that I think the patient will live"
keep in mind all that trash would gone through the oil pump gears, well BEFORE it had any chance of getting trapped in the oil filter. 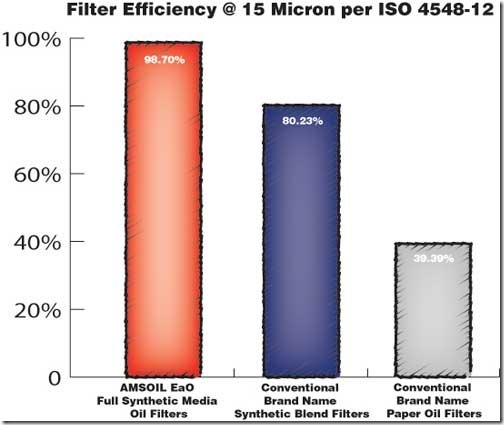 Its too bad most oil filter manufactures don't publish each individual oil flow rates New with 10w30 oil. Test with Hot oil at 220F. Test at 70F room temp. Test at -10 Below F.
Do the differential pressure drop. 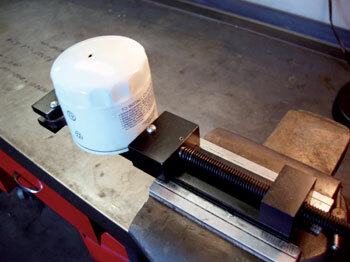 Test at 10 psi increments up to 150 psi. Most oil filters will explode at 80 psi. The steel shell is so thin gauge of steel. Might take some flack but I like the extra thick steel shell. 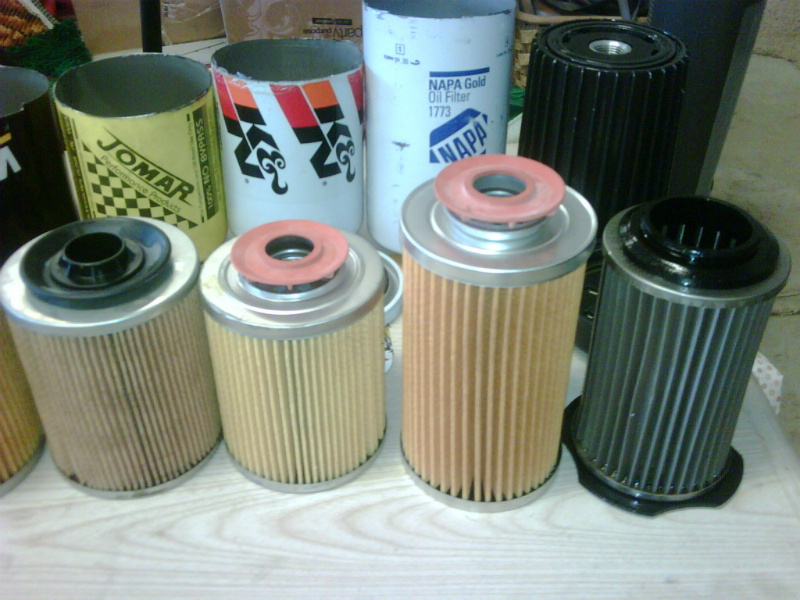 At least 2 to 3 times as thick as other major brand oil filters. The beefiest oil filters are used on Diesel Semi Trucks. They are huge yes but flow lots of oil at 60- 90psi. I don't worry so much about filtration effectiveness. More worried about rated gallons per minute flow rates. The old Fullsize Chevy GMC TRUCK FILTER 2 quart capacity has no drainback Valve, No bypass Valve. Spins right in place of the standard 1quart SBC & BBC filter. I purchased 4 of them for my 410sbc. My old friend Bill used The Chevy 2 quart Truck Filters too. The Video Link was informative Rick. Guys , I've asked two questions, but you have mostly commented on the video. What about the two valves I asked about? Is it because you are not sure either? I have a couple of Sins, so I'm not sending any FLACK your way Brian ! I'm not sure how you meant that, should I have read more links???????? I know how you are about reading all the available info. I'm a big boy (& getting bigger by the minute ) so just tell it to me straight. Was the info in your links??? Believe me I can handle it! Can only say K & N filters have never failed me. I use crazy high oil pressures on Pontiac V8's. So they have plenty of bottom end oil at over 6k. Fram filters have exploded on me at 100 psi. On my Suburban, cold drive away oil pressure is 80psi at 3k rpms. Put a Scatt 9000 series crank in it , vandetvall bearings, melling M55A Z28 oil pump. K&N HP2001 filter. 4X4 model. If you have ground clearance I would use the Chevy 2-quart oil filter. trust me when I say you added substantially to the threads content in a very useful way and no you didn,t fail to read anything that was previously posted that would have made much difference in my opinion, what I was concerned with is the fact that the video brought out a bunch of stuff that I should have gone thru in more detail. .. stuff I barely skimmed thru , because I assume (IN ERROR) at times most guys already know it, info that should have and did require a better explanation,..BTW THANKS THE ADDITIONAL INFO YOU POSTED in that video was a significant addition to the threads content! keep in mind in most answers to questions or threads posted here,I almost always try to keep the answers to questions rather generic so its not specifically linked, or limited to only one specific car or application. Thanks Grumpy, just wanted to make sure! What do you think about my two questions from earlier? Did you mean to say anti-drainback, that's what the question was about??? Does this typically occur in normal situations like on a cold morning, before the engine warms up? What's a typical pressure drop of a new filter and one after 7500 miles? guys reading these threads might be amazed at what they see , once they start looking for facts with a tool that allows a close visual inspection of a filters internal components rather than makes un-informed random guesses. actually knowing what your dealing with is helpful,reading some links and doing research is also much more likely to produce informed answers than engaging in a (IS TOO! VS IS NOT! ) style discussion with someone else whos equally un-informed, like many of the threads posted on dozens of sites seem to be fated to be! 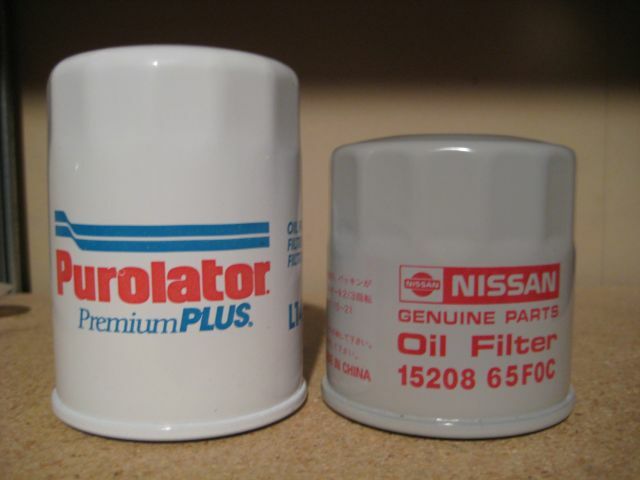 While searching for more info I learned that just because a manufacture has a line of Racing Filters like shown below, that doesn't mean they are going to filter better than their standard line of filters. 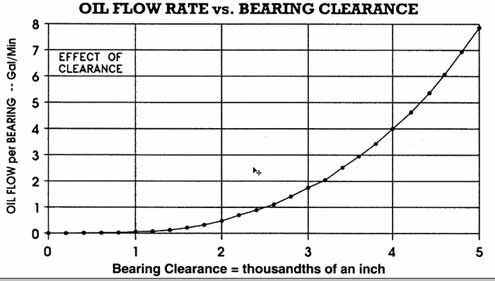 What it does mean is they are going to flow more volume with the same or less pressure drop. 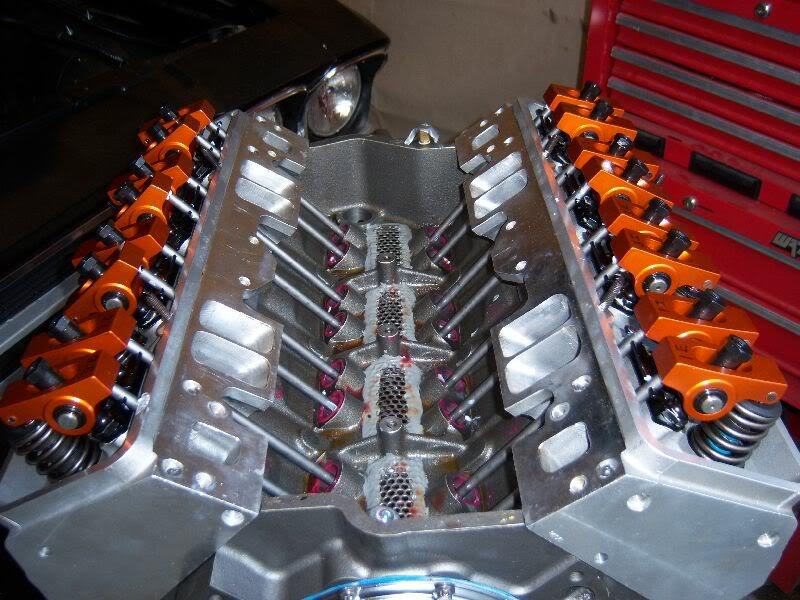 Race cars are normally very well maintained and they need above all else a good flow of oil thru the engine. Chances are the race teams will change oil so frequently that their oil NEVER get anywhere near as dirty as the family car and the standard filter with the lower micron rating. The numbers I remember reading, the standard Wix filter is rated at 21 microns and their Racing Filter is rated at 32 microns. Therefore allowing the racing filter to flow better. NOTE: To find the info below you have to register for Wix Connect. 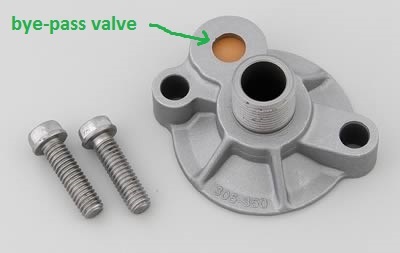 Below is a nice view of the Drainback Valve. 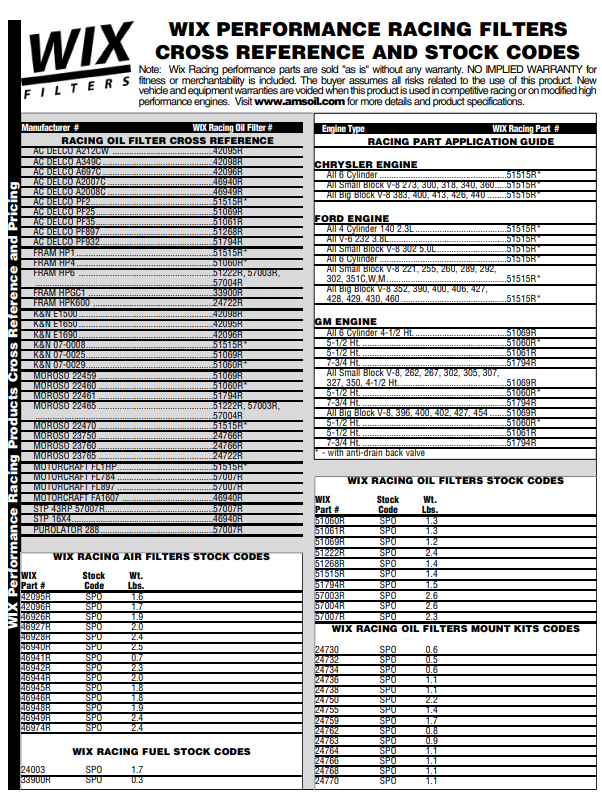 For the immediate future I've decided on the Wix 51061 non racing filter. 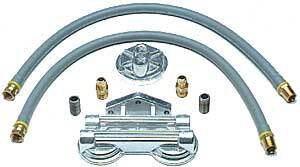 It does not have either the drainback valve or bypass valve. Tell me if I'm wrong, but the filter adapter has a bypass in it, so no use in duplicating the same valve in the filter. Comments and opinion are welcome! That is a primary oil filter bypass valve. Some choose to use stock as is. The theory is in very cold weather operation or high volume oil demands it opens. Bypassing filter. Or if filter plugged. 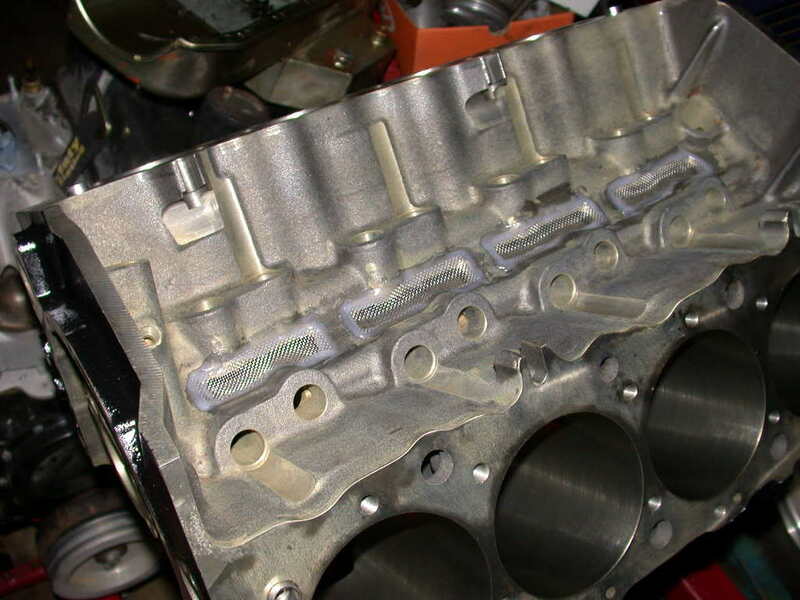 On Pontiac V8 & Oldsmobile V8 engines I block off the factory bypass valve by Tapping for 3/8" NPT plug. 3/4" aluminum to tap into. 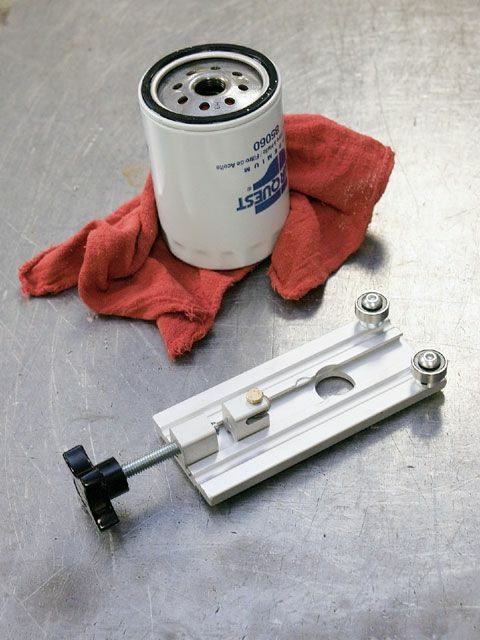 SBC & BBC Oil filter adapter has Around 1/16" aluminum to tap into . Really can't do on Chevrolet safe blocking bypass. I choose to block off. Right or wrong at your own discretion. simpler the better in my opinion.